Secretary of State Condoleezza Rice said Wednesday that stabilizing Iraq will be a lengthy process that will not end when violence in that country - and U.S. troop strength - are reduced. "We're at the beginning of a transition in the Middle East, we're at the beginning of a long process of dealing with what the president called a long time ago a generational challenge to our security brought on by extremism coming principally out of the Middle East," Rice said. A day before President George W. Bush was expected to announce that he plans to reduce the American troop presence in Iraq by as many as 30,000 by next summer, Rice said the U.S. views the task of stabilizing Iraq as not simply improving security within its borders but "to begin to have American forces in lower numbers turn to other responsibilities." Among those, she said, is "the territorial security of Iraq" with respect to its Mideast neighbors, especially Iran. "Iran is a very troublesome neighbor," she said on NBC's "Today" show. "Iran is prepared to fill the vacuum" if the United States leaves Iraq. "That is what is at stake here," Rice said. "What we are prepared to do is to complete the security gains that we've been making, to create circumstances in which an Iraqi government and local officials can find political accommodation, as they are doing in Anbar, and to be able then, from Iraq, with allies in the war on terror, to resist both terrorism and Iranian aggression." 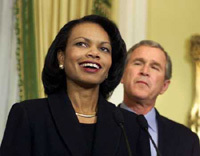 Rice's comments followed two days of testimony from Gen. David Petraeus, the military commander in Iraq, and Ryan Crocker, the U.S. ambassador there. The testimony, though, seemed only to harden positions among lawmakers. Republican conservatives said real progress was finally being made and more time was needed, whereas Democrats said the absence of a political deal in Baghdad meant the strategy failed. Absent any significant changes in the political landscape, Democrats are where they were before the August recess: without the 60 Senate votes needed to pass anti-war legislation unless they soften their demands. The Senate was expected to resume debate on the war next week, although party leaders have yet to announce what measures will be put to a vote. "I don't sense an enhanced sense of skittishness, if that's what you're asking here, on the part of Republican colleagues of mine in the Senate," the party's leader, Sen. Mitch McConnell of Kentucky, told reporters. In a 15-minute address from the White House at 9 p.m. EDT on Thursday (0100 GMT Friday), Bush will endorse the Petraeus and Crocker's recommendations, administration officials told The Associated Press. The White House plans to issue a written status report on the troop buildup on Friday, they said. The officials spoke on condition of anonymity because Bush's speech is not yet final. Bush was rehearsing and polishing his remarks even as Petraeus and Crocker were presenting their arguments for a second day in Congress. The address will stake out a conciliatory tone toward Congress. But while mirroring Petraeus' strategy, Bush will place more conditions on reductions than his general did, insisting that conditions on the ground must warrant cuts and that now-unforeseen events could change the plan. For their part, Democrats have rallied against the plan. "We will continue the fight," House Democratic Speaker Nancy Pelosi told ABC's "Good Morning America" on Wednesday. "I always try to find common ground with the president. ... I am asking him to give an explanation to the American people as to why our country should be engaged in a war without end without end, at least a 10 year commitment to the war in Iraq." While several Republicans peppered Petraeus with questions and criticized the administration's policy during the day, none immediately committed to joining a small group of Republican rebels willing to support a fixed deadline for the withdrawal of all U.S. troops.